polish insomniac: Short 'n Sweet Question of the Week: What's Your Favorite Lipgloss? Short 'n Sweet Question of the Week: What's Your Favorite Lipgloss? I am starting a new fun series entitled "Short 'n Sweet Question of the Week"
My hope is for it to foster interaction between readers! This is an easy one for me! My favorite shade hands down is Apple-A-Day. It deepens my lip color and adds shimmer without being grainy or sticky! 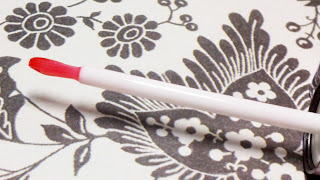 I even prefer the small brush applicator, because it does not pick up too much product as the doe-foot applicators! 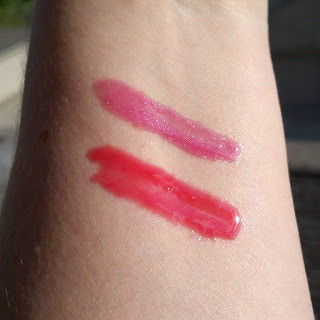 Here are both shades, swatched heavily. 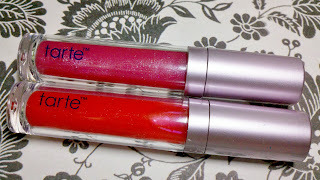 So, back to the question: What's Your Favorite Lipgloss??? There is no time limit to commenting on this post! If you find this post on a later date, I would still love to hear your answer!